I was called out of my first period class this morning to replace the printer cartridge in the main office. My mom once speculated that GATE kids were no smarter than anyone else, they were simply better at getting out of class, and the words rang true this morning. I figured out the printer cartridge and took advantage of the moment to discuss Saturday’s door problem with my pule. 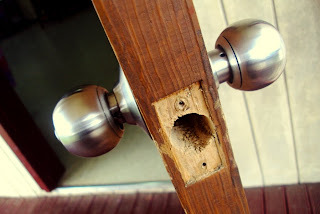 I think he still thought the problem was ridiculous but he agreed to have someone take a look at the door. I have no problem not using an air conditioner. I spend a good chunk of my time out of the lab in different classrooms anyway; going without air conditioning is no big deal. Maybe because my room is on the second floor, maybe because it’s not made out of cinderblock and mortar, maybe because there are 13 machines constantly running, but with all the windows open and a gentle breeze flowing through, my students and I agreed we were baking. The rude awakening was worst for the 10.1s, who I agreed to let use the computer lab afterschool. They paraded in waiting for the lab’s signature wall of cool, only to be greeted by the opposite. About an hour before that fit of sadness, another computer lab in Samoa suffered a worse fate: Phil’s school experienced an abnormally large power spike, and evidently every single computer in his lab exploded. Yikes. I announced the news to my class—in part because power spikes are on the curriculum. In any case, more details on Phil’s situation as they come in. With the 10.1s in the lab having extra-curricular fun, I took the time to play some Freecell. I’ve been doing well lately, and at one point I broke out the calculator to see how many more games I’d have to win to get another bump in my winning percentage. But it turned out my calc.exe file had disappeared. Strange, but not distressing. I came back an hour later to teach my year 13s (camp has started again), and to my great dismay, freecell.exe had disappeared—so much for the winning percentage. I ran my antivirus program to see what was going on, and it recommended I restart immediately. When I logged back in after the restart, I was immediately logged out. And so it’s come to pass that my server’s been eaten by a virus. Bummed about this, I started pacing the floor of my lab while my students skimmed through old PSSC exams. As I paced, I noticed a crack in the floor. 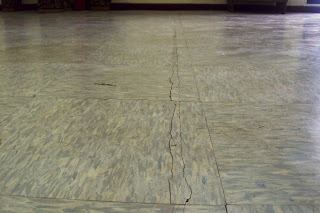 I pointed it out to a couple students, and then a student pointed out there were cracks all over the floor. And it’s true. There’s a huge grid of cracks in the linoleum in my computer lab, no doubt due to The Big One. It was a rough day for technology in Samoa. 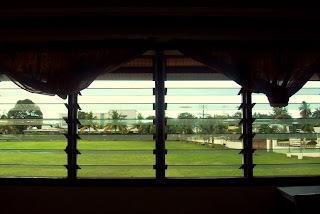 Open windows in my classroom. And it just happened to be Lawnmower Day! 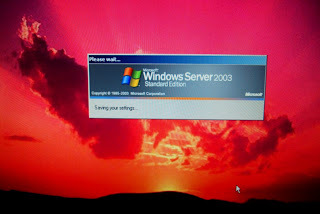 My server saving my settings after automatically logging me out. This guy, Loto, is an art teacher at my school. 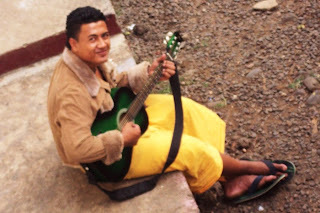 He played guitar through the duration of my year 13 class, which was cool, but not optimal for study, I think. But we kept the door open nonetheless. And it was kinda cool. I've used it to defeat a plethora of viruses/spyware here in the states and it's good at getting rid of about 85% of the malware I encounter here. What happened to Saturday and Tuesday? Where are you?!? Tuesday posted. Was Saturday really not up until right now? I posted Saturday's on time, and I was wondering why it yielded no comments. I'm gonna go ahead and blame Blogger for that one. Sorry I'm an occasional slacker, readers. Malwarebyte's Antimalware, yes. My husband installed that maybe, 3 or 4 years ago.